Navy Command Headquarters at Whale Island provides onlookers with a panoramic vista of Portsmouth Harbour and the Royal Navy’s (RN) pride and joy, its fleet of destroyers and frigates, and soon to be the home of the Navy’s two new aircraft carriers. For Commander Peter Pipkin the RN’s fleet robotics officer who is charged with looking at future maritime capability, the suggestion that maybe in future the vista before him will consist of considerably less ships and more unmanned systems is not something he spends too much time thinking about. He says unmanned systems are not about replacing people or ships, but more about freeing up the RN’s assets (people and ships) to perform more important tasks. “I don’t envisage a future navy without ships,” he says. “What will be different will be the shape and structure of those ships and the tasks they perform. The increased role likely to be played by autonomous and unmanned systems, however, an interesting question to pose to a navy, which has seen significantly reduced manning levels (from the Dreadnought class, which carried a crew of approximately 750 to 800, to the new Type 26 Global Combat Ship, which will only have a crew of 185) on board its ships as they have deployed higher levels of automation and grown in sophistication. Not only that, the RN appears to be at a major crossroads in terms of its ambitions to deploy more unmanned systems, whether it is for mine countermeasures, intelligence, surveillance and reconnaissance (ISR), maritime security or anti-submarine warfare (ASW). Unmanned Warrior, a demonstration of unmanned systems featuring unmanned aerial vehicles (UAVs), unmanned underwater vehicles (UUVs) and unmanned surface vessels (USVs), which will take place off the coast of Scotland in September/October 2016, is the largest showcase of its kind ever staged by the RN and demonstrates its commitment to exploring a future where unmanned systems are likely to play an enlarged role in maritime operations. As the Royal Navy’s Commander Maritime Capability (Aviation), Bow Wheaton pointed out at the UAS Conference at Twickenham Stadium in the UK in December, maritime autonomous systems will increase combat mass and perform ‘dull, dirty and dangerous’ tasks freeing up other assets like the RN’s Lynx and Merlin helicopters to focus on what they do best. But where weapon systems are involved, Cdr. Pipkin says there will always be a man in the loop. “I don’t see that changing. But where we could see a growing demand for autonomy is in more challenging environments in terms of the amount of data we’re firing into our operators. Unmanned systems could run the dull routine processes and flag up when operator intervention is required.” Cdr. Pipkin says the RN is not beyond the realm of rethinking its entire concept of operations in some areas, but adds that won’t change overnight and not until the Navy has generated the evidence with respect to unmanned systems’ feasibility and usability. “Unmanned systems require a degree of consistent demonstration and proof,” says Cdr. Pipkin. Yet, compared to its Air Force and Army counterparts, the RN has relatively less operational experience of working with unmanned systems. Most of its experience is confined to using remotely-operated vehicles like the Seafox for mine disposal. It also operates the ScanEagle fixed-wing unmanned aerial system (UAS) from the Type 23 war ships in the Gulf to gather intelligence (day and night) and survey the wider area of operations. The RN’s ScanEagle capability, first announced in 2013, is delivered under a contractor-owned and operated arrangement with Boeing Defence UK. The ScanEagle, which the US Navy has used for more than a decade, can operate for 15 to 18 hours at distances of up to 70 miles from a ship. The RN has also trialled an optionally-piloted rotorcraft. The trials, which were conducted by AgustaWestland at Llanbedr Airport in Wales, involved the automatic take off and landing of a PZL-Swidnik SW-4 helicopter from a landing system aboard a lorry, which mimicked the pitch and roll of a ship. The helicopter was controlled from a ground station, but there was a pilot on board who could take control if the need arose. The trials explored multi-mission payloads for littoral hydrography and mine countermeasures (hunting sea mines from the air), ship-to-air integration and the ability to land a rotary-wing UAS on a small-decked ship. The launch and recovery of unmanned systems from ships still has some ways to go, however, in terms of proof of concept, says Cdr. Pipkin. “Something frigate or destroyer sized has a flight deck, but we don’t necessarily have the means to start bolting on new launch and recovery mechanisms and even if we do does that come at the potential impact of operating traditional assets like the Lynx, Wildcat and Merlin helicopters?” Cdr. Pipkin says the announcement of a new class of ship, a general purpose frigate, in the 2015 Strategic Defence and Security Review, may provide the answer when it comes to integrating unmanned systems on board ships. However, the design of this ship is still a work in progress. Commander Wheaton says future SDSRs may also look at unmanned combat air systems on board the new generation of QEII-class carriers, which will be in service for the next 50 to 70 years. Following the successful catapult launch of a 3D-printed fixed-wing UAS, the SULSA (Southampton University Laser-Sintered Aircraft) from the bow of the RN’s HMS Mersey last July, the Navy is also interested in exploring the realm of unmanned systems that are potentially configureable. “3D printing means we may be able to print a section of an [unmanned] system that provides a new payload,” explains Cdr. Pipkin.There has also been considerable progress in the area of USVs. 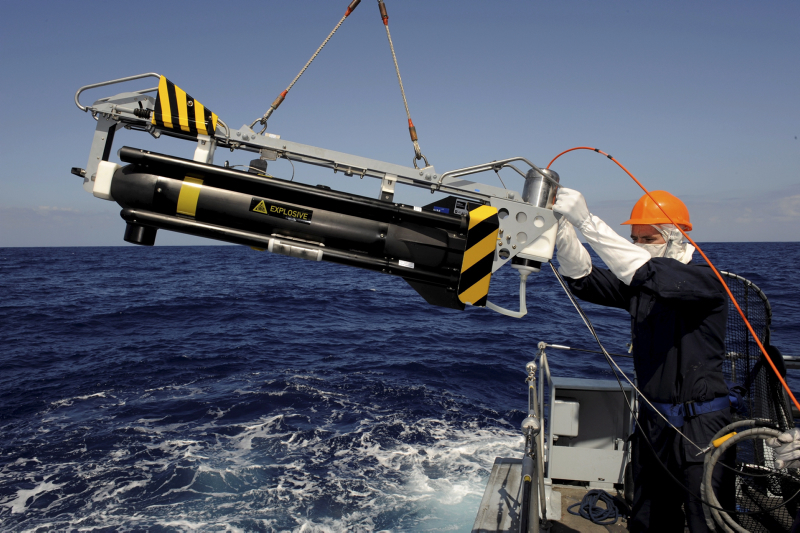 The Thales and ASV Halcyon USV is a key asset in the French–UK Maritime Mine Counter Measures programme (MMCM). Thales, alongside ASV and SeeByte, also recently successfully demonstrated to the UK’s Defence Science and Technology Laboratory (Dstl) a robust, autonomous MCM system based on a collaborative systems approach. In conjunction with ASV, which provided the unmanned system and software, BAE Systems has demonstrated an unmanned rigid inflatable boat or RIB, which can reach speeds of 38 knots,operate at longer distances from a frigate or destroyer and provide enhanced surveillance and reconnaissance capabilities. Below the water, unmanned systems are also likely to play an enlarged role in mine countermeasures, maritime security and ISR. UUVs are one of the key technologies mentioned by the US Department of Defence in its Third Offset Strategy, which talks about the use of mass firepower and maintaining the US’s war-fighting edge. Long-endurance UUVs that resemble fish and that can patrol the ocean for years at a time are currently being developed by the US Office of Naval Research. The maritime domain is abuzz with enthusiasm for everything unmanned. The next phase is to test the interaction between manned and unmanned maritime assets in potential operational scenarios. The NATO Science & Technology Organsation’s Centre for Maritime Research and Experimentation is looking at running simulation exercises that combine real unmanned assets with simulated or ‘virtual’ assets in order to test operational scenarios for port protection, counter-terrorism and the transmission of information both above and below the surface of the water. Navies around the world are exploring the potential use of umanned systems for the detection and disposal of mines. In 2014, the Royal Navy's Maritime Autonomous System Trials Team based in Portsmouth, England, put the remote-controlled motorboat, Hazard, through its paces. Hazard has the capability to hunt and destory mines more quickly than the traditional minehunter vessels maintained by the Navy. A Remus autonomous underwater vehicle, which scans the seabed for mines, was launched from Hazard. "It takes the sailor out of the minefield, but we are not taking them out of the equation," says Lieutenant Commander Jack McWilliams, the officer in command of MASTT. "You will still need individuals with specialist mine warfare and hydrographic skills, a human being to identify a contact, but they will be much safer, and this is a much more effective way of doing our job." 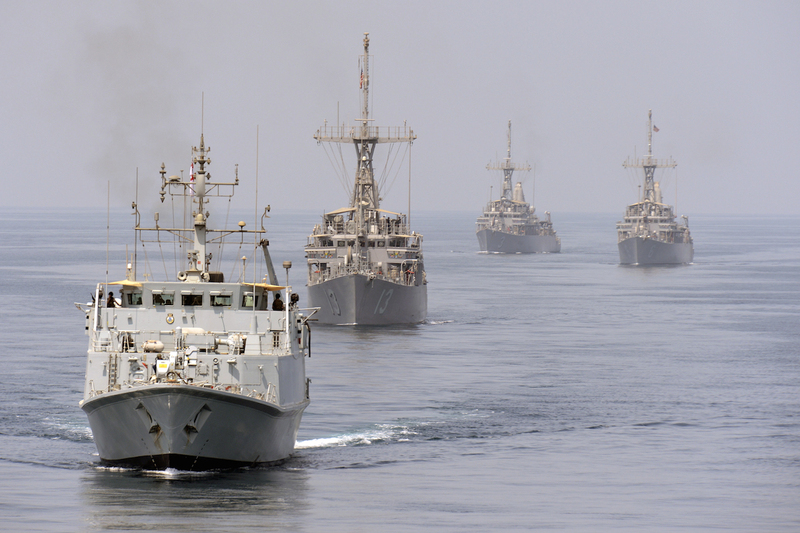 Royal Navy minehunters have also used the remotely-controlled Seafox system, which launches a charge, to detonate mines off the coast of Libya. The next phase is the launch and recovery of an autonomous underwater vehicle like the Remus from an umanned surface vessel. Lanching an AUV from a ASV would allow the traditional minehunter vessels to remain a safe distance away from the mine's location. 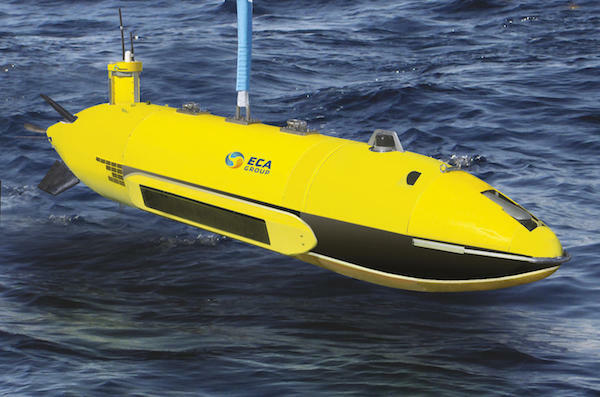 In September, French-based ECA Robotics announced the successful completion of the French Ministry of Defence's ESPADON programme for future mine countermeasures. The use of ASVs and AUVs also enables the disposal of several mines at the same time, which is viewed as a more effective means of disposing of historical mines left over from World War II. The aim of the programme was to prove that robotic systems could be used for underwater minewarfare operations instead of conventional minehunters with the goal not to expose minehunter crews to considerable danger due to the simple fact that these vessels operate in known mine fields. ECA Group was in charge for all the robotics components of the system. In particular ECA produced the long endurance A27 autonomous underwater vehicles (AUV), the A18-T inpection AUV, the Sterenn-Du USV remote control system as well as the AUV launch and recovery system from a USV. As part of the tests conducted, both the A27 and A18-T AUV were deployed by the Sterenn-Du demonstrating that it was possible for USVs to deploy AUVs for full-scale mine countermeasure operations paving the way for the “robotics based” new generation of mine countermeasure systems that some navies have already decided to use. The A27 AUVs have been selected for the Anglo-French Maritime Mine Counter Measure (MMCM) programme.